Power factor correction (PFC) is used to correct what is called the power factor of an electrical system. 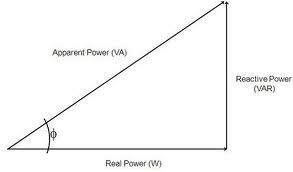 The power factor is a ratio of the active or real power (P) flowing to the load versus the apparent power (S). These two values are related to each other using a power triangle, shown below, with S2 = P2 + Q2 . The angle of the active and apparent power is the phase difference between the current and voltage of the system. Therefore when there is no phase difference this angle will be zero and the active power will equal the apparent power and there will be a power factor of one. Phase differences occur when inductive or capacitive loads are present and one to correct these differences is by using the opposite device. So for an inductive load, capacitors should be used to improve the power factor. This is the basic principle behind power factor correction. Where do you use PFC? Many ultility companies use PFC to increase effeciency and reduce the current drawn on their lines to reduce transmission losses. For residential uses PFC does not help very much unless the curcuit contains many inductive loads such as washing machines or refrigerators.